Some headway in digging out of the hole made by counterfeit parts and certifications, bribery, and influence peddling in the South Korean nuclear program is becoming apparent. One of the reactors shut down during this time has been approved for restart, and there is evidence that replacement parts for others will check out. Reuters has reported that Hanbit No. 2 (formerly known as Yeonggwang No. 2) will be allowed to restart after checks performed on welds in one of its steam generators. South Korea's plants of the type derived from the Combustion Engineering System 80 design, obtained under technology transfer years back, have been known to experience premature steam generator tube wear. The plant noted in the link immediately above, Ulchin No. 4, was later mentioned in reporting by Chosun Ilbo in May 2012 as requiring a steam generator replacement. An op-ed in The Hankyoreh published December 2011 tells us that 25% of the 16,000 steam generator tubes were damaged, and laments the fact "that this happened in just 28 months for a steam generator with a design life of 30 years." Reuters, in the same report linked at the top notes - in a separate issue - that replacement control cables have tested satisfactory and can be used to replace those supplied by JS Cable. This story is long running - see links below to previous Atomic Power Review articles for the background. South Korea's Nuclear Energy Program - A Primer. Atomic Power Review follows the early history of this nation's nuclear energy program, and then follows the development of the line of plants derived from the Combustion Engineering CE80 design obtained by technology transfer. Energy for the future includes nuclear increase ... Interestingly, it has been reported in the Korea Times that a new study by South Korea's Ministry of Trade, Industry and Energy now predicts a steady increase in the use of nuclear energy through the year 2035. This works in slight contrast to the announcement from the government that a new target for nuclear generation that is less than a third of the total generating mix has been set, but is not inherently contradictory. The plain fact is that South Korea continues, even in light of the nuclear parts and benefits scandals, to fine tune its energy mix for optimal performance and cost - in terms of the nation's industrial output and standing in the world, it has no intent of reversal. Energy is king, and energy the nation will have. Among many places very hard hit by today's extensive severe weather outbreak was the USEC Paducah Gaseous Diffusion plant. A site emergency was declared when a suspected tornado touchdown occurred on site. "Update: Most of the damage was confined to the exteriors of plant structures. No production systems were affected and all critical safety systems continued to function as intended. 1 of the plant's 4 enrichment production buildings, adjacent cooling towers and an electrical switchyard sustained most of the damage. A recovery team has been appointed and will coordinate the cleanup and repair. Background: USEC ceased enriching uranium at the plant in June. Only limited plant operations related to inventory management were ongoing at the time of the storm." According to reports in media and via USEC's Twitter account, a site emergency alert was declared at 2:17 PM CDT Sunday when a suspected tornado touchdown caused damage to the above noted structures. The emergency alert status was ended at 6:06 PM CDT Sunday. No releases of either radioactive or other hazardous materials occurred and there were no on-site injuries. USEC's Twitter account noted shortly after the alert that there was no off-site impact and that "plant operations remain stable." Relevant news articles can be found linked below. 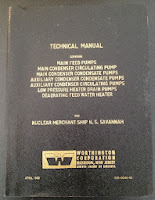 APR Readers: I've had some time away from the blog as I was attending and working at the American Nuclear Society's 2013 Winter Meeting for the last week. 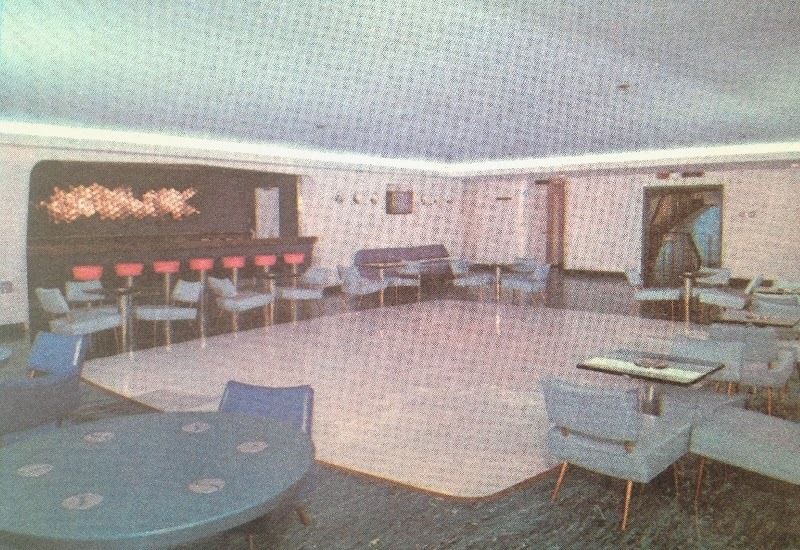 (You may have seen some of the posts at ANS Nuclear Cafe.) I'm back in the saddle, as it were, and we start off with another press release from the folks at SCE as they continue to work through what has become a very protracted process to achieve a final settlement regarding the failed steam generators at San Onofre Nuclear Generating Station. Press release below courtesy Southern California Edison. It's time for the longest-running tradition among the top pro-nuclear English language bloggers and authors -- the weekly Carnival -- to again appear at Atomic Power Review after what feels like an extended absence. This does not mean we'll get right to the posts without asking you.. "What is this?" We can see a number of people arranged around some equipment, with someone at the far left pointing toward some of it. This means that the answer to this question cannot be "a bunch of guys standing around machinery." Some of you will do far better than that... and there is partial credit available for this photo. All will be revealed.. AFTER the Carnival entries! The construction of TVA's Watts Bar 2 plant is said to be "on track;" also, more reactors for Pakistan and Jordan signal a trend growing elsewhere. Amongst the most secretive and best-financed is Tri-Alpha energy. They’ve released nothing more than a Powerpoint, but have raised somewhere over $140 million from the likes of Goldman Sachs, Microsoft co founder Paul Allen, Russian tech investment firm Rusnano, and, weirdly, former LA Law star Harry Hamlin. APR note: Folks, Rick has provided a synopsis for this piece but I'm going to toss it and tell this to you straight. This is an IMPORTANT piece to read. We all need to think in some way or another about how and where we fit into the whole, swirling mass that encompasses energy awareness, energy dialogue, energy policy. Rick has provided some very thought provoking and even evocative imagery and conception with this post which is certain to leave everyone thinking about what the entire massive range of effects education and involvement can have on everything in society. I'd like to give this piece a serious recommendation. This week at Nuke Power Talk, Gail Marcus reflects on the fact that the closure of Vermont Yankee was precipitated by marketplace inequities put in place to encourage renewables. She opines that, if such measures result in the closure of other low-carbon power sources, namely nuclear power, they are counterproductive. However, repealing existing renewable energy benefits without substituting other provisions is likely to be difficult politically. Different solutions are needed. to the outright mandating of renewables, is a point of great contention. Result: high costs of power generation, coupled with high emissions. But there is a relatively simple way to rectify. How much money have Fukushima refugees received in compensation from Tokyo Electric Power Company? It took me several days to get my mind around the numbers. I had a feeling the stipends were considerable, but NOTHING like this. No wonder so many Fukushima evacuees say they won't go home when the restriction is lifted. Being a refugee has become big business. When Vermont Yankee announced it would close, the Vermont Public Service Board was still considering the plant's application for a Certificate of Public Good CPG through 2032. Entergy amended its request, asking for a one-year CPG through the end of 2014. Governor Shumlin's administration immediately recommended that the Public Service Board only give such a certificate if Entergy deposited $60 million in a new fund for decommissioning and sent over four million to the state government to help the state deal with this "sudden, unplanned shutdown." In other words, when it comes to Vermont Yankee, Vermont is still in a state of extortion. Sixteen legislators from important committees drove to Vernon, Vermont, the home of Vermont Yankee. There, they went to the Vernon Elementary School to listen to the local reaction to the plan of the plant closing. They seemed quite shocked to find economic pain. However, one key legislator said that they had "more appreciation" of what was going on in the area, and that was a "big accomplishment." Another in a series of educational pieces which attempts to educate readers on the realities of nuclear technology, using familiar analogies and relationships. That's it for this week's Carnival entries! All that's left is to answer ... "What is this?" For those of you who said "those look like steam turbines," you get one third credit. 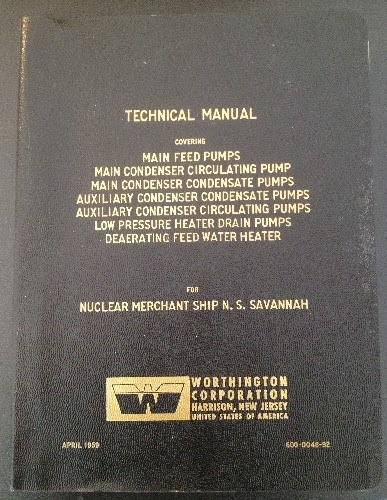 For those of you who recognized this equipment as steam turbine propulsion equipment for a ship, you get half credit. Anyone who guessed that this was the propulsion equipment for the nuclear powered merchant ship N.S. Savannah gets three quarters credit. For anyone who guessed that this photo shows the equipment under test BEFORE it was ever installed in the ship -- full credit. This equipment comprises compounded turbines and reduction gears. In this photo we can see at far right at the upper corner the steam chest and throttle assembly mounted on the high pressure turbine. The turbine casing, doughnut shaped, is next (to the left) followed by the high speed drive pinion casing, and the big rounded intermediate gear casing on top of the very large bull gear casing. The other turbine is the low pressure turbine .. much larger, and slower ... with its own pinion and gear casings. The attachment for an emergency electric drive motor is visible on the end of the low pressure turbine drive pinion casing. As to the description of the power output; 20,000 HP was the contracted sustained output, but the maximum was higher than this. 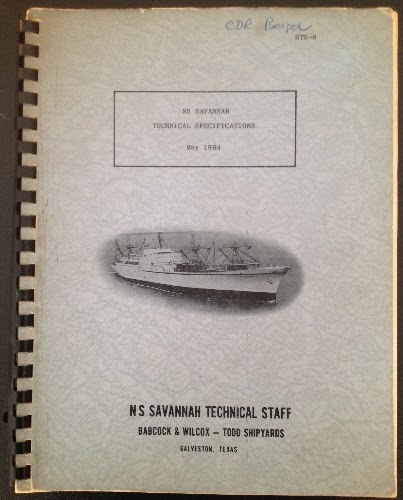 At left we see my copy of the NS Savannah Technical Specifications, May 1964 as published by the NS Savannah Technical Staff jointly manned by Babcock & Wilcox and Todd Shipyards. Page 17, Specification 6: "The main propulsion unit shall be capable of delivering 22,000 SHP in maximum continuous duty. The astern power capability shall be 8,000 SHP. The propulsion unit shall be equipped with a 750 HP reversible electric motor." Steam conditions at full rated power were 425 psig and 454 F, with a total steam flow rate of 307,500 lbs/hr. 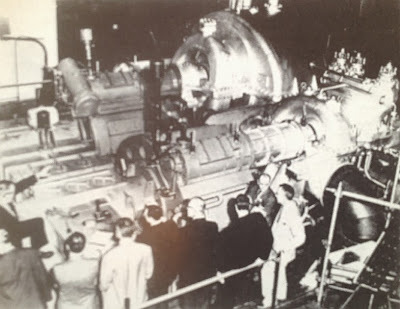 The steam plant was equipped with a steam dump direct to the condenser which could handle a maximum flow rate of 190,000 lbs/hr. Above, a view of the power plant control room located in the engine room of the NS Savannah. This station is glassed-in; the panels you are seeing are on the after end, while windows (to the right of the camera) look out over the engine room (and the turbines we've seen earlier.) 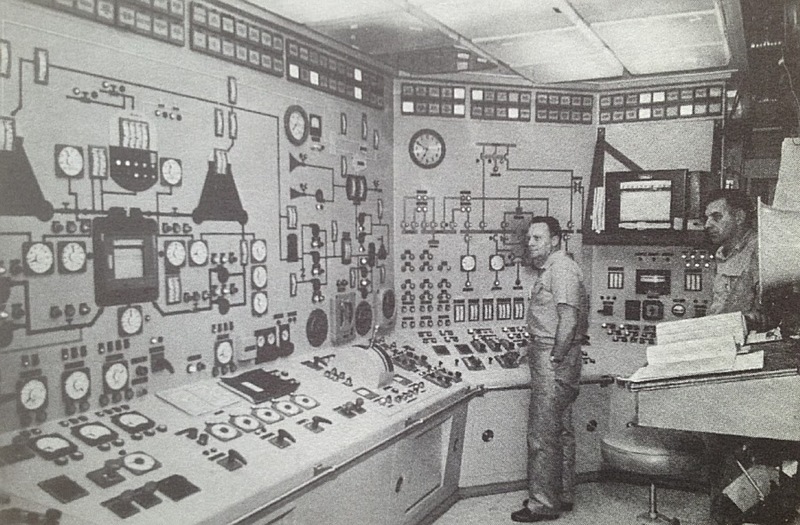 The panel we see at extreme left is the reactor plant control panel, with diagrammatic depictions of the reactor at center, pressurizer above it, and two steam generators either side. To the right end of the same section is the steam plant control, with large hydraulic throttle operator. Specifications for the throttles called for a design opening or closing time for ahead throttle of at least 25 seconds and at least 14 seconds for the astern throttle. 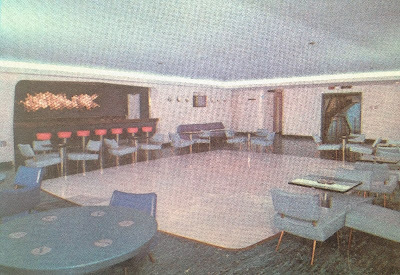 This illustration comes from the official tour brochure for the NS Savannah, printed by States Marine Lines (original operator of the ship for MARAD) and a copy of which is in my collection. By the way -- as some of you know, I've stood right where this photo was taken. 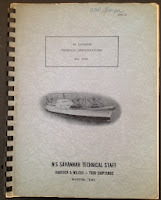 Years back I had the opportunity to do some work on the NS Savannah, and toured many normally off limits spaces with the then-curator of the Patriots Point Naval Museum. I'm doing this particular feature this time for the Carnival because ... over 20 years later ... I will set foot again on this ship NEXT WEEK as part of the American Nuclear Society's Winter Meeting. You'll see full coverage of that tour on the ANS Nuclear Cafe blog. I really look forward to both a very active ANS Winter Meeting... and a very fantastic tour at the end of it that has historical tones, nostalgic tones, and implications for the future. You'll see the full story at ANS Nuclear Cafe --- so don't miss it!